August has just flown right by and with it our latest Lander Academy has come and gone. In case you missed it, last Wednesday Phil Sharp, Marketing Manager over at UserTesting.com served up an awesome presentation, shedding light on the possibility of hidden problems with our websites and how we can fix things conducting Usability Testing. So, if you missed it and you’re having trouble with your site with no clue as to what might be wrong or just what you need to do about it, this latest post is going to be very eye opening. Here you’ll find the the best points of Phil's presentation and making good on our promise, the whole Webinar recorded just for you. Let’s get started! Why can’t I see the problems affecting my site? 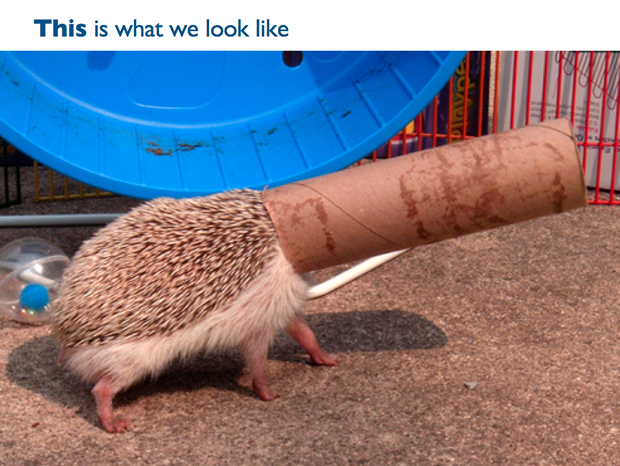 Phil explained to us that as owners of our websites, we have a tendency to experience “tunnel vision” at times. Ok so what exactly does that mean? Well, it means that we are biased, let’s face it, nobody knows better than us right? We spend so much time so focused on our website, working on it, how can anything possibly be wrong? Well this exact attitude can, in turn, cause us to miss exactly what’s really so painfully obvious. The problems can be right in front of our face but we’ll miss it because of our one sided “tunnel vision! Obvious issues that are seriously affecting our websites are right in front of us just begging for us to correct. This is why we need to get started on “knowing what we don’t know” and doing something about it. And the perfect remedy for that is User Testing, to unveil hidden issues with our website that we weren't even aware about. What we really need is an objective, unbiased opinion and real people with fresh eyes. We need to get our websites right in front of everyday folks who can provide us with some “real world” feedback. Let’s get real and understand that the kind of feedback we need to hear is maybe what our egos don’t want to hear right? Now, we know this might be a bit painful to hear and might make us cringe a bit but we need to be brutally honest with ourselves about our websites right? It’s true, and the fact is that this kind of feedback is exactly what we want because it will help us improve our sites. 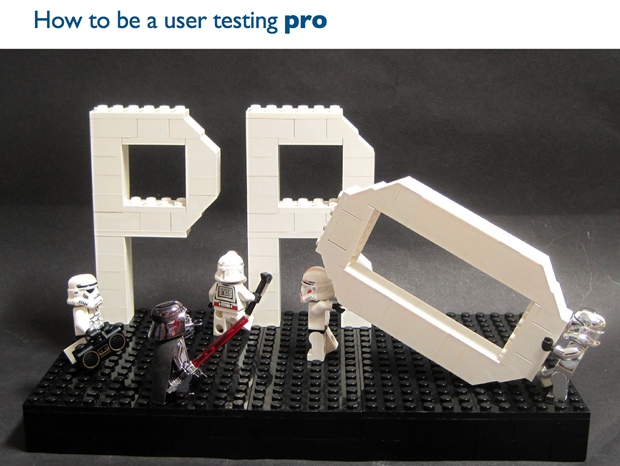 And without further adeu, that’s exactly what user testing is. It’s watching real people interact with our sites and learning from it and then making the appropriate changes. Doing this will snap us out of our one-sided, jaded form of tunnel vision and help us start to see the bigger picture and understand exactly why things are happening the way they are on our websites. In fact, user testing is one of the few tools we really have that can tell us just why things are happening on our websites the way they are. Ok maybe you’re thinking that you have to have tons of sprawling data to know exactly what is happening on your website. Well, that's true to an extent, but you need enough data to know exactly not just WHAT is happening but also, and equally important, the WHY things are happening. Let’s take a look below to see the difference. How many people visited a page? How many people are filling out this form? Which version of the A/B test won? Why are people bouncing from this page? Why is nobody buying this product you really want them to? Why aren't people subscribing to your blog? 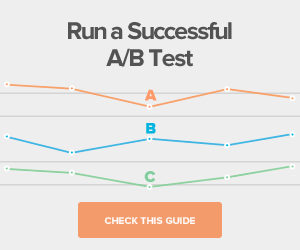 Why did the B version of your A/B test win? Most of the time we can’t know why things are happening until we actually see people interacting with our site. So by answering these important WHY questions and snapping us out of our lame tunnel vision we’ll be able to improve our sites and make them easier for our visitors to use right from the get-go. Our users will be happier, tell their friends about us, remember us, think of us, and connect with us. In other words, you’ll increase your conversions and your sales and ultimately you’ll be happier right? Phil explained to us that with User Testing what we’re really trying to do is get a hold of nice people that are outside of our personal bubbles or spheres of influence. People that don’t have the same tunnel vision or views that we do and aren't influenced by our tunnel vision. This way we’ll be able to have a more honest opinion about how things are working and functioning when they interact with our websites. Well Phil told us that we should test Everything and when he said everything he meant everything. But we know that could be a little be overwhelming so he point us out 11 things we should test. Take note! It’s really important to identify the following: What’s important to them? What do they do first? Do they read any of your copy? Is there a picture that catches their eye? Are they actually able to add something to their cart and get through the process? These broad tests will spark tons of A/B test ideas. Phils said that this is the type of test that you should be running with 3-5 participants every month. It’s open-ended and will alert you to any big problems that are costing you sales. You don’t just have to test your own site, you can test any site. Have users go to your site, and two of your competitors site. Which would they buy from? Why? Which is their least favorite? Why? Don’t let people know what company you’re with. Don’t get defensive. Test out all of the About Us pages. 3. Search: Start further up the funnel. You can test how people search to get information further up the funnel. 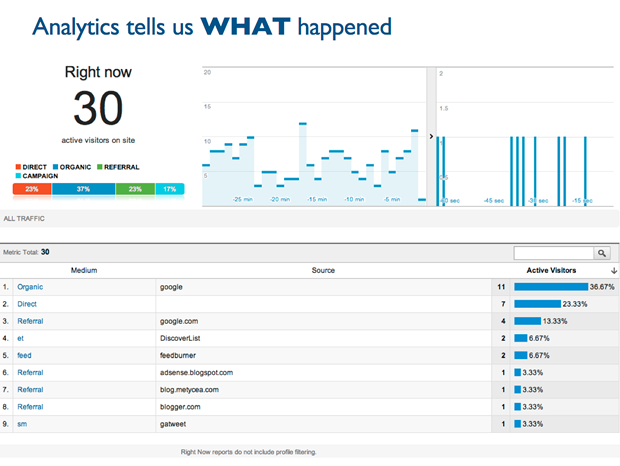 Your analytics will tell you what people do once they're on your site, but what about everything that happens before hand!? Let them go through the process of researching and deciding where they might want to go. Take note of what appeals to them, obstacles they face, the type of information they're looking for, and how they come to their final decision. Do they notice the paid ads? What catches their eye? Do they go to page two of Google results? Then you can see how they interact with the search results. What catches their eye? Are you anywhere on the page for them? Where do they click? 4. What do they think of the landing page? 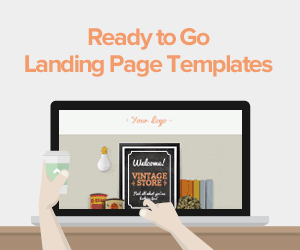 When they click, what do they think of the landing page, what do they like about it? Dislike about it? 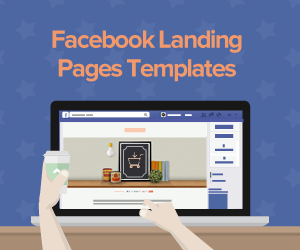 Even if they don’t click on your ad you’ll still learn a ton of valuable information. This is all information that you can use to inform your strategy, improve your site, and make more money. 5 Navigation: Find it without using search. A great way for you to test this on your own site is to ask someone to find a specific item on your site without using internal search. 6. 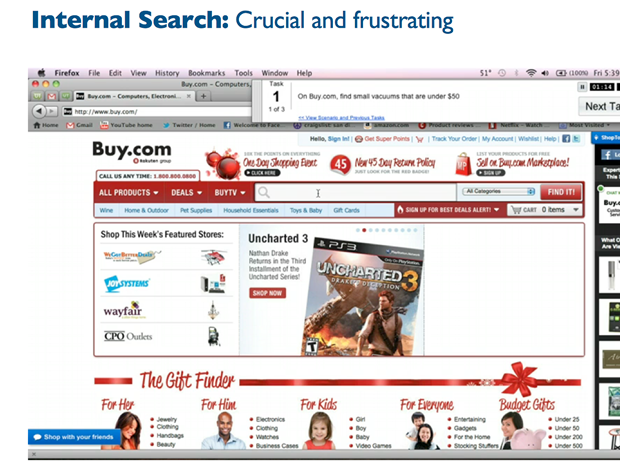 Internal Search: Crucial and frustrating. 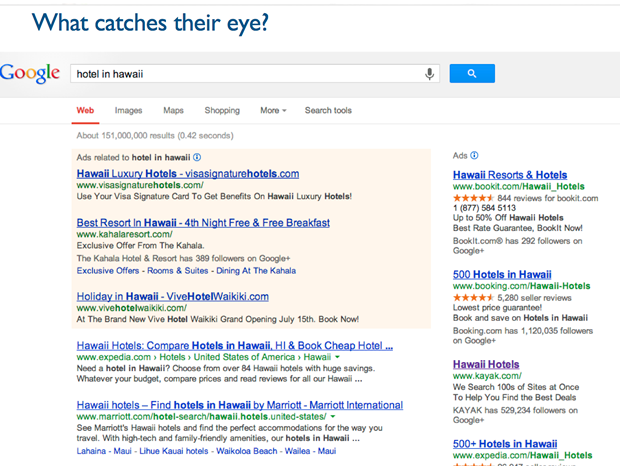 There’s a good chance that 10% of your site visitors are using your internal search. When they search for your most popular items, do you know what the results look like? Search results often don’t account for typos, plurals, hyphens or other variants. A search box that isn't long enough. Search results that simply don’t make any sense. Search results that aren't sorted by priority. 7. 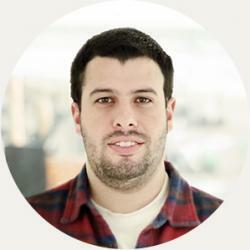 Wireframes: Save time and money. Take the wireframe, get it in front of people, look at results an hour later. Iterate, repeat. Do people get it? Do they know what my site is about? Where would they click first? Why? How easy is it for folks to buy from you? Pay close attention to what they’re doing, where they get hung up, are they looking for things that they can’t find? Do they want a method of payment you don’t have? 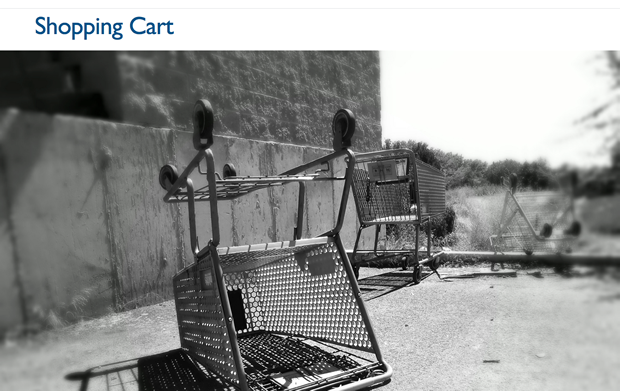 Are they being distracted and leaving your cart? Does everyone wonder about the return policy? What security information is important to you? Can you find it? Ask your testers to find your return policy (and perhaps your satisfaction guarantee, price match guarantee, etc. ), and ask them whether it’s easy enough to find, and whether they have any concerns or fears that haven’t been addressed. Since it’s one of the last steps in the funnel, making changes to your shopping cart can generate boatloads of money for you. That’s why Phil recommends testing your shopping cart at least monthly. 9. What’s your email experience like? Since we’re surrounded by this stuff all the time, it’s easy for us to miss things that would be obvious to other people. The easiest way to get the basic feedback on copy and layout and landing page, is just to host the email on line and run some tests on it. You’ll quickly be able to tell if people “get it”. It’s like the advanced version of reading things out loud. 10. 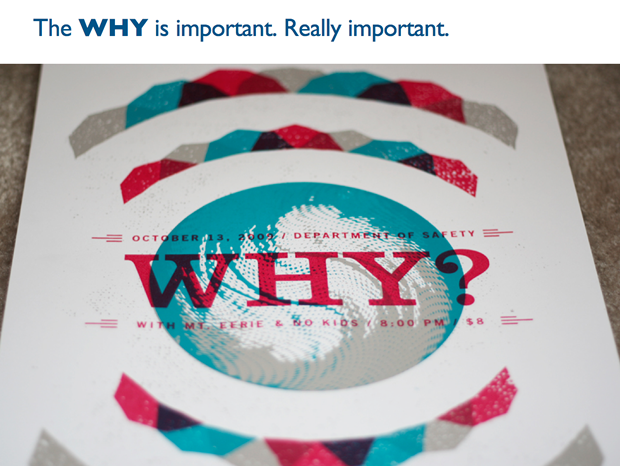 Blog posts and infographics. With blog posts and infographics you probably send them around internally for some proofing, but you should also be sending those to a few people outside of the bubble of your company. 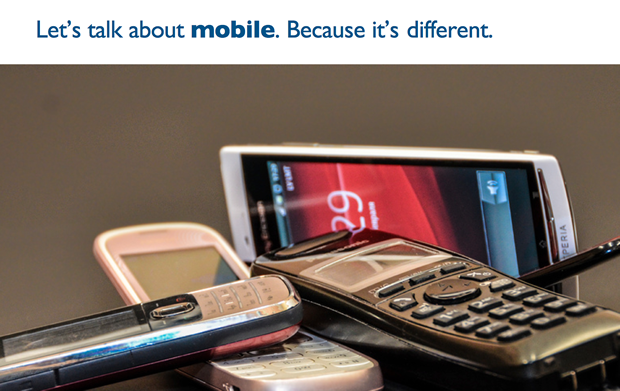 Mobile is bigger now than it was last year, and will be bigger next year than it is this year. You can't ignore it. Prospective customers are browsing your site from their phones and tablets. Will they find the product or information they're looking for? Will they have a great experience? What if they’re on Android? Or an iPhone? What if your site uses flash or requires hovering for tooltips or other information? What's the experience like on your mobile site or app? Is your site mobile ready? What if they rotate their screens? When I was a kid my mom would always ask me, "When was the last time you showered?" If I couldn't remember, then she made me go take a shower. It's the same for user testing. If you can't remember the last time you ran a test, then it's time to run a test! So Phil teach us not to ever forget about the tunnel vision. 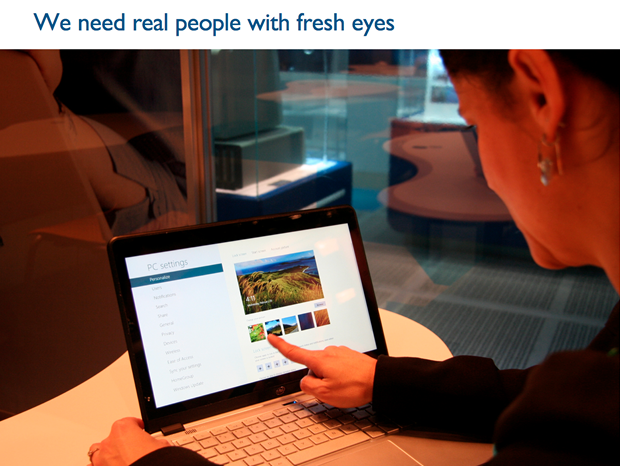 Make a better product, a better experience, and more money, by getting people with fresh eyes and testing everything. Last but not least if you missed the webinar or if you want to watch it again here’s the whole Webinar recorded for you, to watch it as many times as you want and write down the best tips for you and your business! 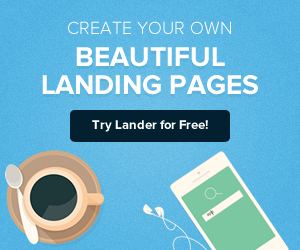 We hope this Lander Academy with guys at UserTesting.com was useful for you, now we want you to start testing your sites. We hope to see you again in our next Lander Academy. Stay tuned to see which topic we will teach you this time!